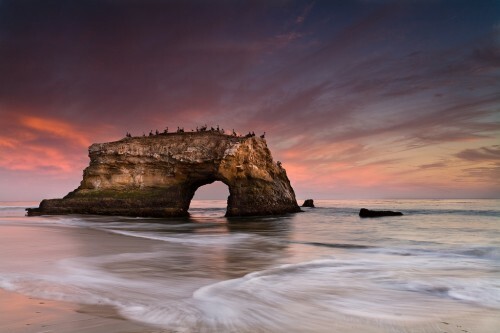 Natural Bridges State Park – Santa Cruz California. There’s peace and then there’s peaceful. Ahh. Photos like that make my heart ache. @Puulaahi: What kind of birds are perched there? Look like Pelicans to me too. Their are so many coastal birds here, impossible to know them all. Man, I need new glasses. I was about to post a question, then I remembered a thing called Google. This reminds me of Haystack Rock which is shown in The Goonies, which I’ve just found out was filmed up the coast in Oregon. Astoria, Oregon. I have always wanted to visit that place. I am a big fan of The Goonies too. Well this image was taken in Santa Cruz California. Most of the birds found on top are Brown Pelicans.